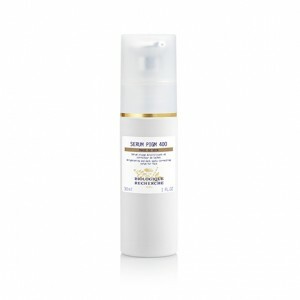 Sérum PIGM 400 is specially formulated with six concentrated active ingredients to prevent dark spots from appearing and reduce the appearance of existing dark spots. This brightening, spot-correcting serum will fight free radicals and offer photoprotection to defend the skin against sunlight and slow skin ageing. The watercress sprout, wakame seeweed and plum pulp extracts will illuminate the complexion; leaving your skin visibly brighter and more uniform. A dual action thanks to a combination of brightening and protective active ingredients. This active formula can be used all over the face to give an overall brightness or localised if you have particular areas needing pigmentation care. Whitening and brightening agents: Watercress Sprout Extract and Soy-based Pure Genistein, Chromanyl Palmitate-based Synthetic Peptide, Plum Pulp extract, Biomimetic Peptide, Sea Lily Extract, Wakame (Seaweed) Extract. Protective agents: Anti-ROS and anti-RNS Antioxidant, Wasabi Extract.